I groped around in the misty morning, searching for my daily clarity occasionally found by looking through the viewfinder. The August mountain flowers and fog, I noticed, are stitched together by pearly webs. 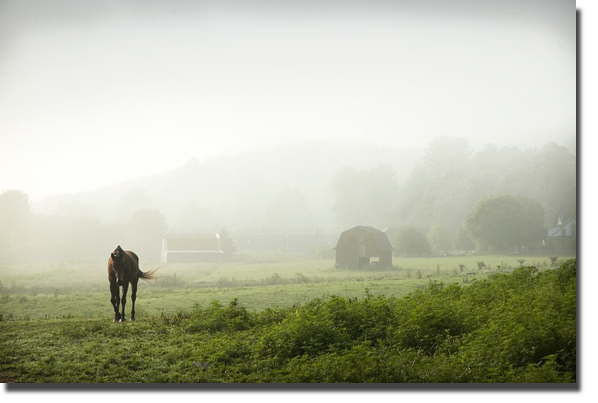 I wandered into the Valle where one Keith Ward's horses lumbered from the field to the barn for breakfast. I saw my first Iron Weed making its debut on Broadstone Road. The Joe Pye and sunflowers are bending from the weight of their blooms, so much so, that driving by them on a narrow gravel road with the windows down, is an open invitation to receive a perfume smack. Butterflies flock to the Milkweed. It is their addiction, as is the month of August in the Blue Ridge mine own.